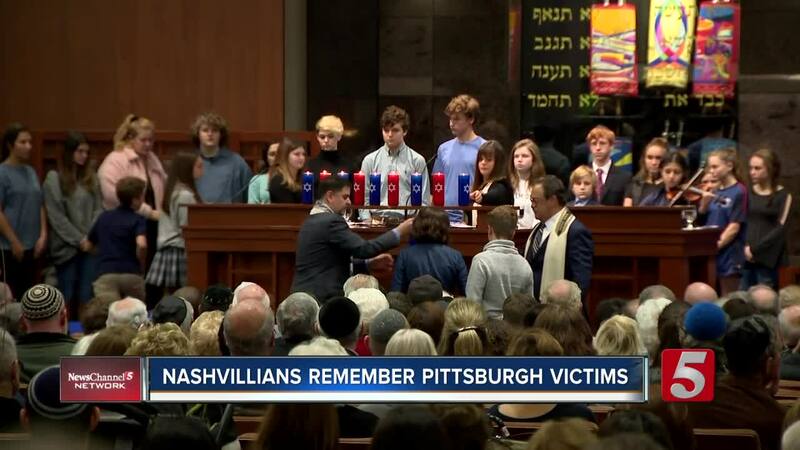 People from across Nashville came together for a vigil to remember those killed in the synagogue shooting in Pittsburgh. The city-wide memorial service was held at the Temple in Belle Meade. It was organized by the Jewish Federation and the Nashville Board of Rabbis, but was open to people of all faiths. People started lining up for the 6 p.m. service before 4:45 p.m., and the crowd packed into the main sanctuary and areas featuring overflow seating. Five rabbis addressed the crowd, and the emotional service featured prayer and music. Eleven candles were lit in honor of the eleven lives lost in Pittsburgh. Robert Bowers is accused of opening fire at the Tree of Life synagogue Saturday morning. In addition to the eleven people killed, six people were injured, including four police officers. Local Rabbis denounced the violence as an act of hate, and called for peace and love. Others said the tremendous turnout at the memorial service, was just the latest comforting gesture from the community. “The outpouring of support that came almost within minutes from Muslim, Catholic and Christian colleagues softens the pain, and reminds me we are a blessed and special community here in Nashville, “ said Rabbi Laurie Rice. The memorial service marked the second time people in Nashville came together to honor the victims in Pittsburgh. A vigil was also held on the Vanderbilt University campus Monday afternoon. The school’s Provost and Vice Chancellor for Academic Affairs spoke, and there were prayers and readings from various faith leaders on campus. Metro Police increased security at local synagogues and other Jewish buildings following the shooting over the weekend.